Today is National Chocolate Caramel Day! Don't you just love these food holidays? Be sure and read last year's post for Chocolate Caramel Day: Caramel Filled Chocolate Cookies, Milk Duds, and a short review of some local chocolatiers' chocolate covered caramels. I also had a post for Chocolate Caramel Trifle at Thanksgiving. One of my favorite caramel sauces is Recchiuti's Burnt Caramel Sauce. 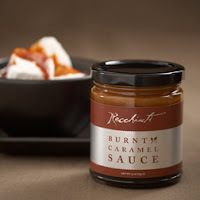 This sauce is perfect in the following recipe, and you can order it online. Of course, the Recchiuti Fleur de Sel Caramels are a real favorite of mine. Each dark chocolate caramel is a perfect balance of salty and sweet. They are addictive. Great for today's Chocolate Caramel celebration! As in any recipe I post, I hope you'll experiment with different chocolate, cocoa, and other ingredients. This easy recipe is adapted from a recipe in one of my favorite magazines: Country Living. 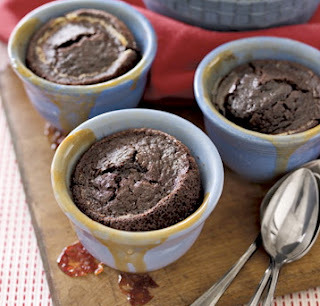 The final warm chocolate caramel cakes is a variation on molten chocolate cakes. Your guests--and you--will love the surprise when you bite into them! Caramel and chocolate goes so well together. 1. Coat six 6-ounce ramekins with softened butter. Chill in the freezer for about 10 minutes, and brush with a second coat of butter. Pour 3 tablespoons caramel sauce into the bottom of each ramekin and transfer to the freezer for 1 hour. 2. Whisk the cake flour, cocoa, baking soda, sugar, and salt together in a large bowl and set aside. Stir the coffee, oil, vanilla, and vinegar together and whisk into the flour mixture just until smooth. 3. Fill each ramekin with 1/3 cup of batter. Bake at 400 degrees F until the cake is set and a toothpick inserted in the center comes out clean, and the caramel has bubbled up the sides, about 20 minutes. Great! Consumption of chocolate and other flavanol rich foods like red wine and tea can also reduce stress and increase performance on cognitive tests.